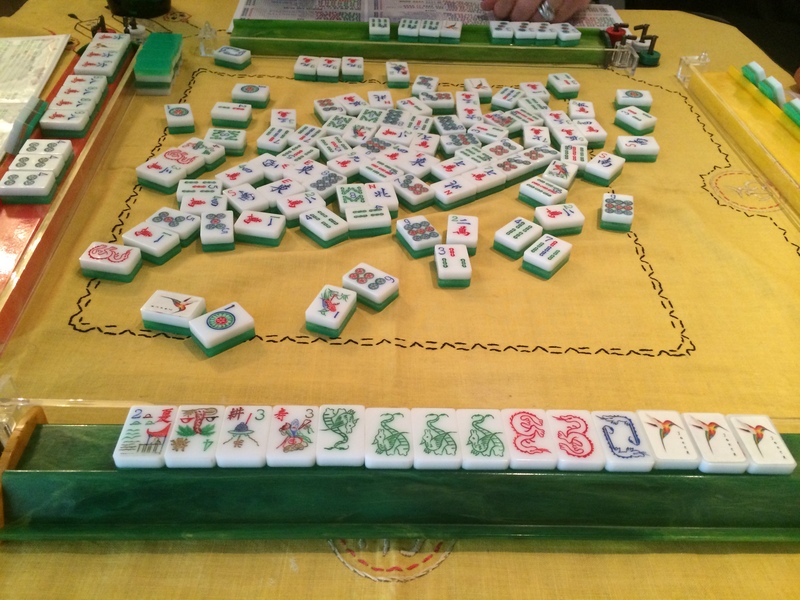 Yesterday was my turn to host our weekly Mah Jongg game and I was happy to do so. I was really looking forward to serving this Mediterranean lunch since it does feel as if the sun is actually out again after the horrid winter. 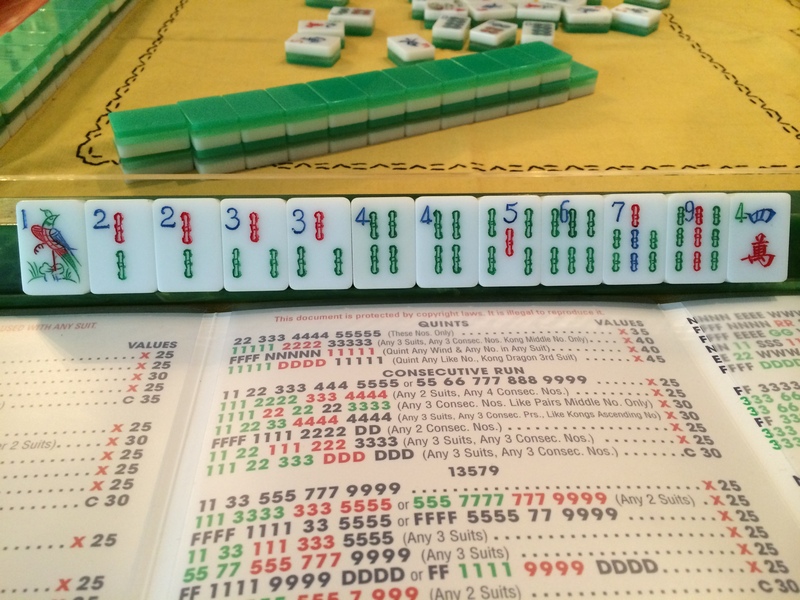 Recipes will be posted tomorrow but in the meantime, here are some pictures of our lunch and some hands played from the new NMJL 2014 card. This was such a fun lunch to prepare. The homemade hummus (so much better than store-bought and so easy to make!) was yummy – right before everyone arrived I drizzled some Sriracha and some olive oil on it and a few toasted pignoli. The feta cheese had some olive oil and pepper on it and then some thyme leaves. And, at the last moment, I sprinkle some minced parsley on the homemade Tzatziki (again, a really easy recipe). The pita triangles were toasted for about 10 minutes until they were crispy and delicious. 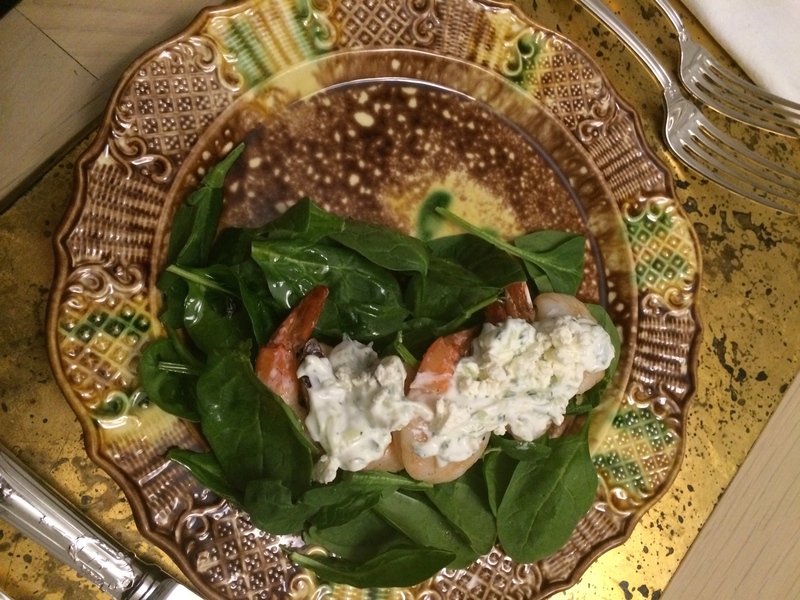 The main course was a bed of baby spinach drizzled with olive oil and fresh lemon juice with roasted shrimp on top of the spinach. 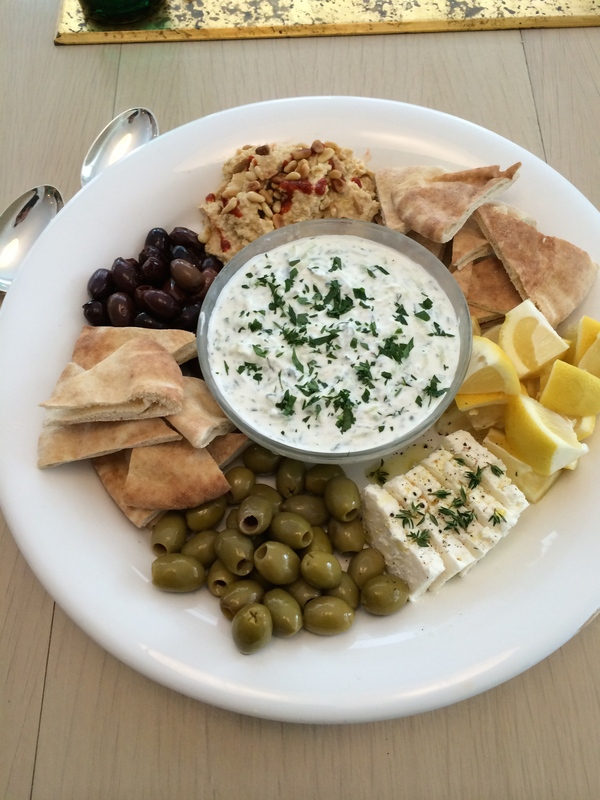 Then I spooned some Tzatziki over the shrimp and sprinkled some feta crumbles on top of that – YUM! After lunch we started our game play using the new NMJL 2014 card for the first time. My initial thought on this card is that I like it so much better than the 2013 card. Here was one of my hands shortly after the Charleston. I wondered what I was going to do with this hand but my first instinct was to do a consecutive hand – duh! 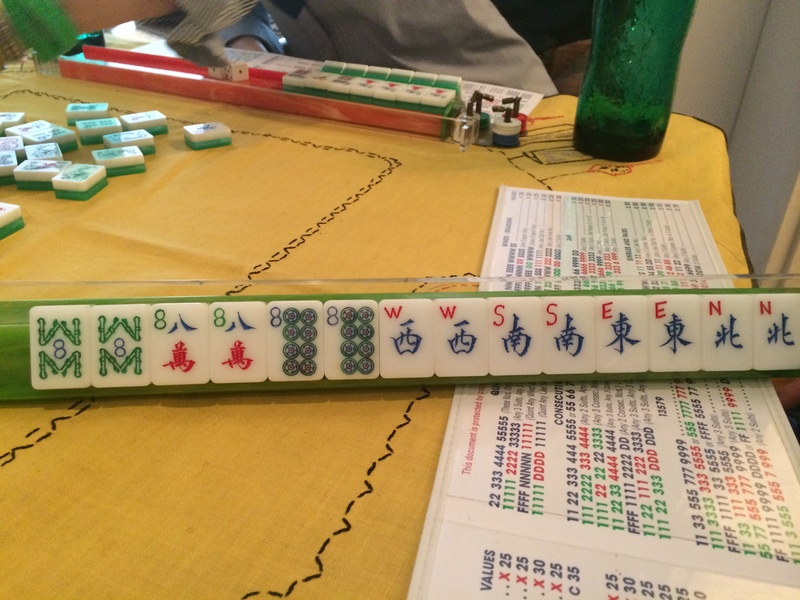 As this hand wound down, I was getting very close to having Mah Jongg but I missed a much needed One Bam by one turn and that ended my hopes of winning. 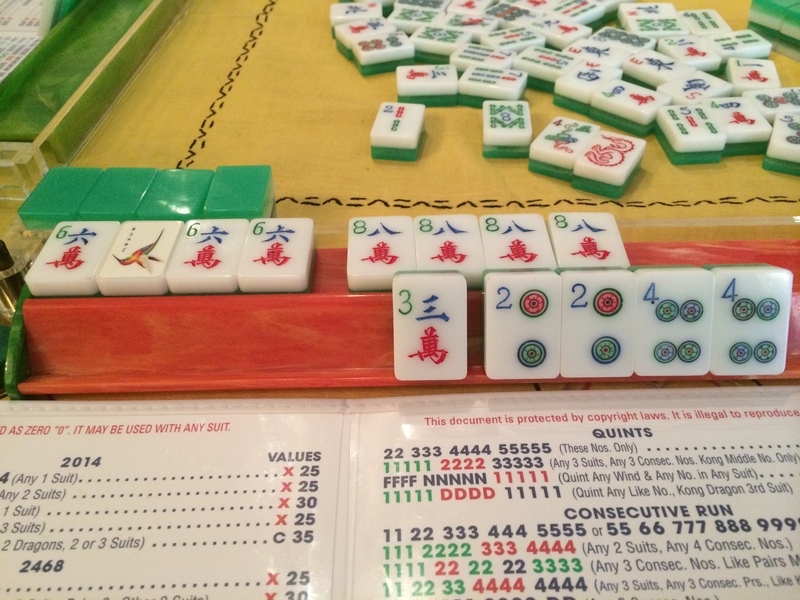 However, I eventually was successful on the next hand that we played – it was fun to play this new combination…and having three Jokers didn’t hurt, either! 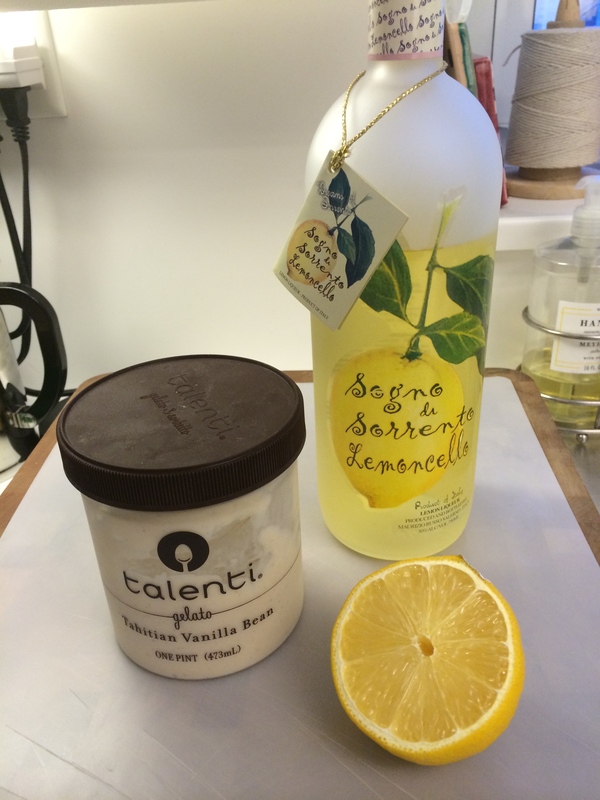 After we had played a number of games I brought out dessert – my new favorite thing to serve: Talenti Vanilla Bean Gelato with a drizzle of limoncello liqueur and a delicious biscotti from Grace’s Marketplace stuck into the gelato. 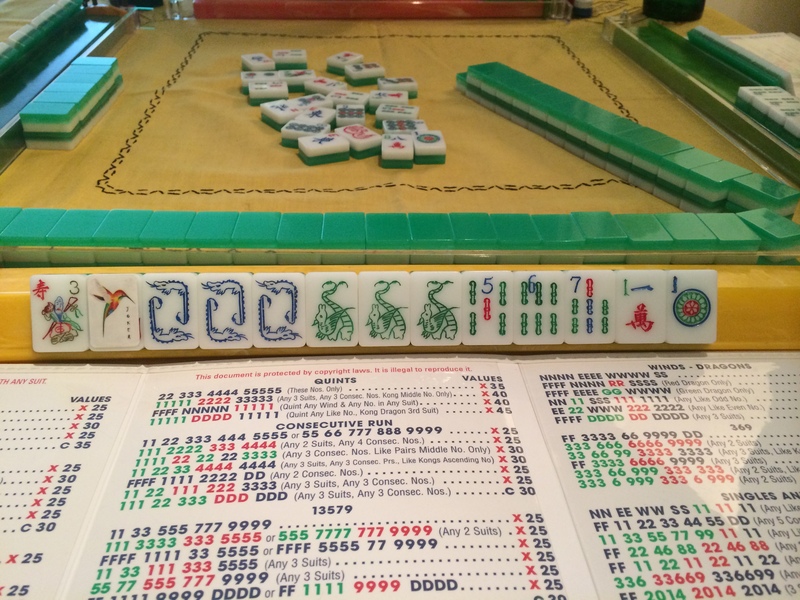 The next hand was a particularly exciting one to win – D did a great job putting together this pairs hand…beautiful! 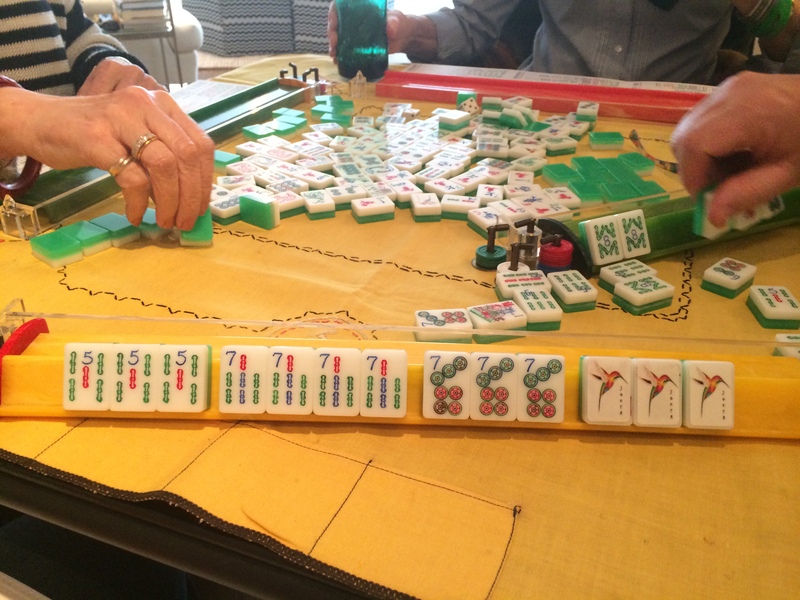 On the next hand I sat out and was watching P put together her tiles. 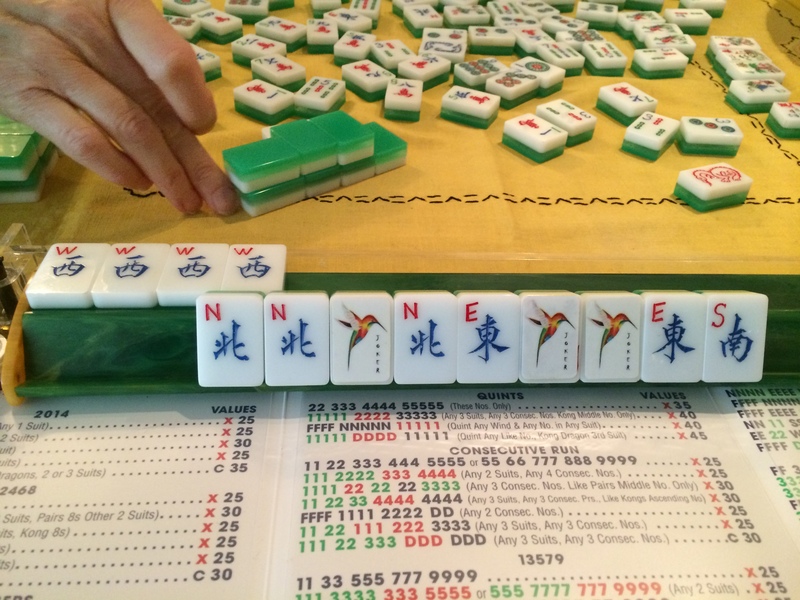 I thought for sure that she would declare Mah Jongg…if only she had been able to pick up one more Joker, that is! 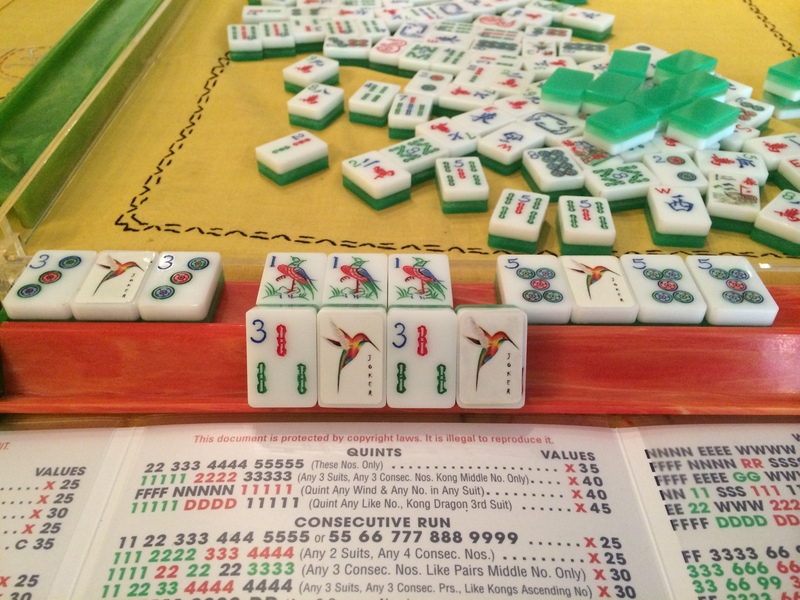 I was feeling confident on this next hand but J beat me to the punch when I discarded a Red Dragon and she was able to declare Mah Jongg with it! 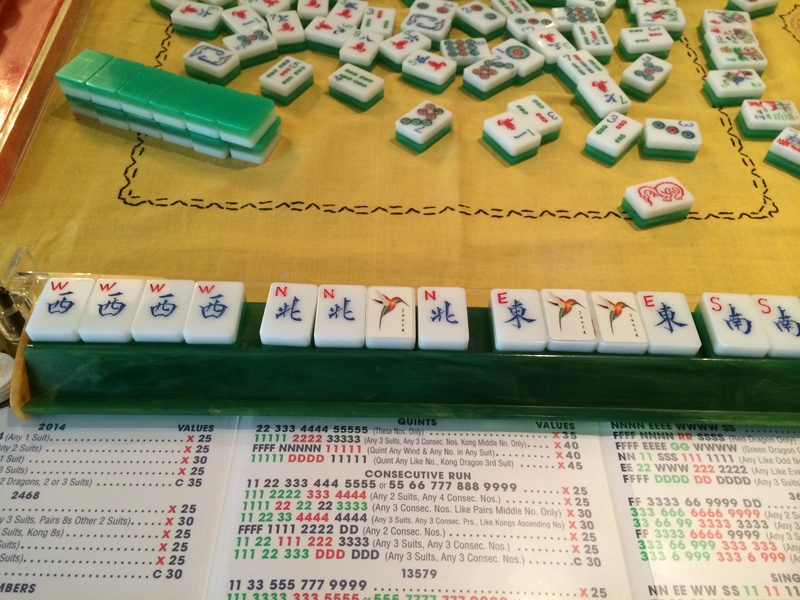 This was the last hand of the day – and I would have declared Mah Jongg had I picked up that last Joker…but alas, this was only a dream!!! No matter what, it was great playing with this new card and working on brand new combinations and hands. 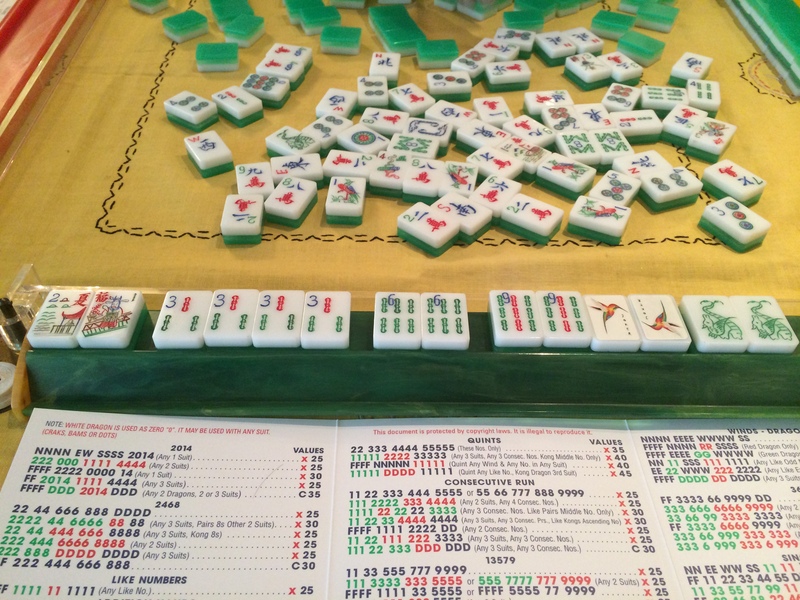 I am looking forward to a great year of Mah Jongg with this card! 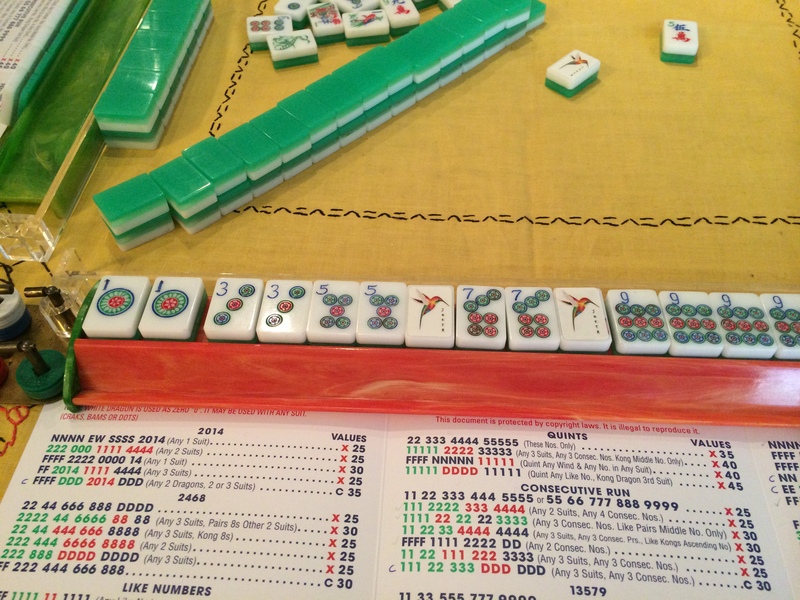 This entry was posted in Mah Jongg and Me and tagged 2014, card, feta, hummus, limoncello, mah jongg, Mediterranean, nmjl, olive oil, pignoli, pita, shrimp, sriracha, talenti gelato, tzatziki on April 3, 2014 by Mah Jongg and Me.